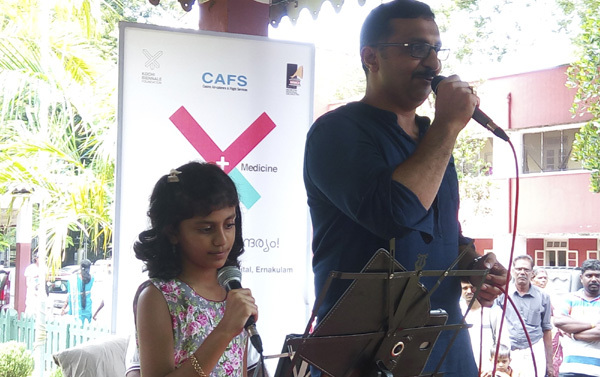 Kochi, Aug 23: An engineer by profession, Joju John Mathew proved that he is just as proficient at singing after teaming up with his talented nine-year-old daughter for a rollicking musical performance for patients at the all Wednesday ‘Arts and Medicine’ programme organized by the Kochi Biennale Foundation here at the Government General Hospital. Rena Susan Mathew, Joju’s daughter and a sprightly fourth grader at the International Indian School in Saudi Arabia, started the programme with a prayer song. With the festival season round the corner, Joju set the tone with ‘Medaponnaniyum Konna’ from the Mohanlal starrer Devasuram. ‘Andhiveyil Ponnuthirum’ from the Mohanlal movie Ulladakam which has a nostalgic touch, was followed up with Rena’s rendition of ‘Lali Lalee’ from the movie Kalimannu. Together the father-daughter team livened up the stage with over a dozen of melodies and vintage songs, including the duet ‘Ponveena Ennulil’ from yet another Mohanlal starrer Thalavattom, all of which drew loud applause from the audience gathered in the lawns and the corridors. Joju added a North Indian flavor to the musical feast with the evergreen Hindi song, ‘Jab Deep Jale Aana’ which was interspersed into the medley of Malayalam songs. Rena sang two solos much to the amazement of the listeners. Joju, who has had a keen interest in music right from childhood, currently works as an engineer in Saudi Arabia. He is the lead singer for the music troupe ‘Symphony’ and also a choir master and passionate pianist. Rena also sings for ‘Symphony’ and participates in cultural programmes at school. The musical extravaganza which came into being in 2014 entered its 184th episode this week. Various professional and amateur artists have shared the KBF stage to provide solace to the patients through therapeutic music. Arts and Medicine is an initiative of the KBF in association with Mehboob Memorial Orchestra and is sponsored by CAFS (Casino Air Caterers & Flight Services).